Ansonia Clock Co. Royal Bonn clock, signed, "La Vogue", C. 1901. It was both etched in the case and stamped on the case, before the firing. It is 12.75" high and 11.25" wide, clean inside and out, perfect case. 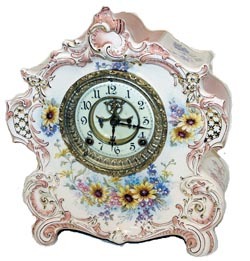 There are very faint hairlines or imperfections in the 2 piece porcelain dial. Brass sash, rings, and bezel, all polished. Correct hands, open escape mechanism, and pendulum. Movement as always is 8 day, half hour gong strike, running good. Unusual coloring scheme, primary color is cream, with coral-pink highlights on the top and sides, and around the outer edge of the front. Beautiful yellow, purple, and pink flowers. Nice gold accents used discretely and sparingly. Complete and 100% original. Came with a collection of other Ansonia clocks. Ly-Ansonia, page 620.